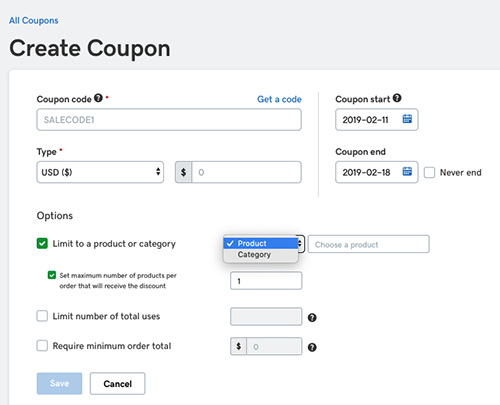 Create coupon codes to offer discounts to customers. From the Promote tab, click Coupons. Coupon code Enter your own or click Get a code to generate and insert a number. Coupons end Set a start and end date for offer. Click Save, and the Coupons page lists the new coupon. Click the pencil icon next to a coupon to change it or the trash icon to delete it. Note: Customers who receive the coupon code can apply it during checkout. To further promote your store, see Connect to Facebook. To learn more about coupons and other promotional methods, see Promoting your products with social media.